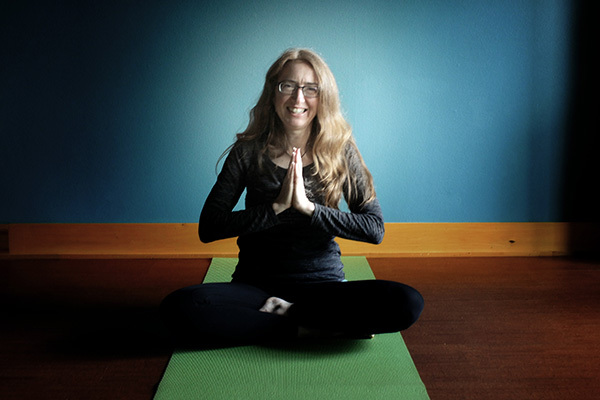 After an early childhood introduction to yoga practice from her mom, Ginger rediscovered yoga after moving to Seattle in 1998 and has been hooked ever since. During her 200-hour certification training at 8 Limbs Yoga Centers, Ginger continued to develop her personal style of yoga, approaching it as a holistic endeavor, incorporating intention-setting, spiritual connection, focus on the lines of energy through the body, as well as proper alignment in asana to maximize the benefits of each pose, open the paths of prana through the body and energy field, and to preserve the health and well-being of the body and its joints long-term. Pranayama, meditation, and chanting are dear to her heart and she follows the yogic principle that asana and pranayama are gateways to deepening one’s meditation practice and thus one’s connection with whatever one considers divine energy. When not on the mat, Ginger can be found either at her computer programming job, singing, playing the flute, or enjoying the beauty of Seattle with friends and family.